In the pressure washer world, Generac is a well-established brand. 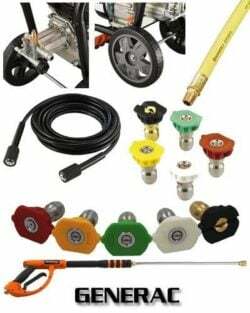 Without any hesitation, you can depend on this brand to buy your desired pressure washer. 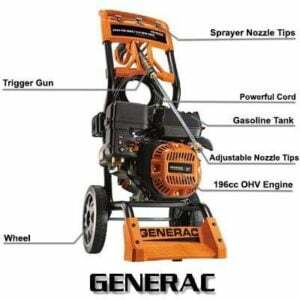 Generac 6595 2500PSI 2.3 GPM 196cc OHV Gas Pressure Washer is a unique model of the Company that combines all the possible features that are necessary for your residential use. Besides, the device nicely combines some other facilities with its heavy power that helps you do the heavy duty cleaning. The 196cc engine generates 2500 PSI water pressure and the Axial Cam Pump provides 2.3 GPM of water flow. The 25-foot high-pressure PVC hose gives you the maximum convenience and it can be easily connected to the pump and to the rear of the spray gun. The price of this device makes it more appropriate so that the buyers are always on the gaining side. Generac 6595 2500PSI 2.3 GPM 196cc OHV Gas Pressure Washer has many admirable features that will blow your mind. Generac 196cc OHV engine easily creates 2500 PSI water pressure to give you maximum cleaning performance and reliability. The Axial Cam Pump is easy to connect with the hose and it gives you relief from kneeling on the ground. It has ergonomic spray gun that has cushion grip handle for the easy-to-pull trigger which reduces fatigue. With the 25-foot high-pressure hose, you can easily move the spray gun as you required and use it conveniently. The on-board spray gun holder keeps the gun and gives you relief from unnecessary tension. The easy access controls provide friendly user facilities when switching it on/off or chock and fuel shutoff. The 196cc OHV engine is featured with low oil shutdown. The pump delivers 2.3 Gallon Per Minute (GPM) of water flow. Its unique foot rest stabilizes the device while starting thus making you tension free. There are three convenient nozzle tips are provided with the device keeping the user’s different requirements in mind. The nozzles include 0-ddgree pencil point, 25-degree wide range and a soap applicator nozzle tip for your car’s shiny look. Powerful Engine: Power means everything and you will realize it when you are in need. You don’t have to worry about the heavy duty cleaning in your home as the motor provides you a water pressure very close to a commercial pressure washer. The combination of water pressure and water flow makes the entire tough cleaning do easily. Convenient Nozzle Tips: Keeping your different uses in mind the manufacturer provides three different nozzles accommodating 0, 25-degree and a soap applicator nozzle. With the 0-degree pencil point spray, you can reach all the corner parts easily while the 25-degree spray will help cleaning the flat surface. Easy-To-Hold Spray Gun: The spray gun has a very comfortable cushion grip that allows you an efficient and convenient cleaning. If you cannot hold your gun comfortably it interrupts in your cleaning business. The device comes with one of the best pro-style spray guns. Warranty: To defend your valuable investment the manufacturer provides you two years of limited warranty. The Company is always ready to help you out in your difficult time and will replace any parts free of cost within these two years. The device doesn’t have a detergent tank which might be a problem for some people. Some users have informed that Generac products are a little louder than the other pressures in the same class. It might be the case because of its powerful engine. Most of the time we cannot buy the pressure washer that we desire for as the budget comes in between. When we consider all the features and facilities that Generac 6595 2500PSI 2.3 GPM 196cc OHV Gas Pressure Washer gives the price seems pretty less. So in order to buy your desired pressure washer, you don’t have to worry about a high budget. The power of this device will blow your mind and will give you an efficient cleaning. Its easy movement and convenient gripped spray gun will make you a good friend and will serve you as and when required. By selecting this product you will make an excellent choice. Click Here To See Latest Price & Buy on Amazon, Now!